and now for a word about ahavas yisroel. .. ... ahavas yisroel does not mean that you are commanded to only love and respect your fellow jew if he or she happens to have exactly the same religious beliefs as you do. i realize that as shocking as this may seem it is true. so many in the world dislike jews, that we don't have to add to it by hating or disrespecting each other. those who hate jews dont differentiate between different jewish denominations. they hate us all equally. we should learn from this. 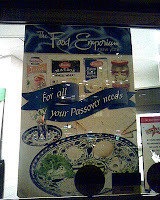 pesach is on the way . have we not learned anything? my grandfather used to have this silly saying when i was a kid. he used to say, "i scream, you scream, we all scream for ice cream" . well... i am nuts for ice cream and now there is actually a kosher gelato place called scream. the only thing is when you get gelato there you aren't screaming for the ice cream, you are screaming about the price! 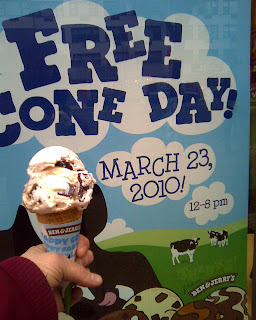 on a happier ice cream note, today was ben and jerry's free cone day. they give you free ice cream and in turn they want you to donate to a breast cancer cure charity. in manhattan today it was cloudy and drizzly, but it didn't deter me from waiting in line for my scoop of mint chunk ice cream. it was my pre- pesach scoop of ben and jerry's ice cream. the slightly rainy weather didn't stop people from lining up for their free scoop. i think the line was even longer than when i went last year for free cone day and it was sunny last year. i always enjoy attending free cone day and its not just because you get free ice cream. i love pouring over the flavors of the free cone day list while im waiting in line. today the choices were vanilla, chocolate brownie, one sweet whirled, sweet cream and something or the other, berry sorbet, chocolate cookie dough, coffee buzz and probably one other flavor i don't remember because it didn't appeal to me. for me, coffee buzz and mint chunk were tied . i chose mint chunk because when i saw people licking their cones of mint chunk i just had to have it. at first i was going to choose coffee buzz because its not as easy to find in the grocer's freezer, but the peer pressure of the mint chunk eaters made me choose mint chunk. i wasn't disappointed. it was really yummy. it always amazes me how much i deliberate about the flavor choices of the free cone. i deliberate as if i were actually paying for it and want to make sure i get my money's worth. sadly, i think i deliberate over the free cone MORE than if i would be paying for it. mind you, its not as if i wouldn't treat myself to an ice cream cone every so often. it seems that when i get something for free, it just better be worth it. did you ever have a nagging feeling about something or someone, ignore it and then realize you should have listened to it? i know i have . usually, this gut feeling strikes me when im dating someone . out of nowhere i get a vibe and then it turns out to be real. the vibe might be about something i wouldnt expect, but it always turns out to have meaning. sometimes these gut feelings freak me out because though they are there, even if at first i may not realize exactly what they are warning me about. these vibes arent always bad vibes either. sometimes i have a really good feeling about someone and it turns out to be correct as well. vibes are tricky. they come to you but you cant conjure them. wanting something to work out with someone doesnt mean one has a good vibe about them. the gut feeling goes against all of those who abide by the "you never know " hoax. you really do know why after one date you dont have any interest in mr. x even if you cant express why. often ive decided i didnt want to continue dating someone just because of a gut feeling it wouldnt work out and years later found someone who dated him who revealed exactly why it was a very good thing i did not continue dating mr. x, y or z.
when i was growing up in the midwest the kosher l'pesach aisles in the supermarkets were much larger than they are now . here in the new york area there is quite an abundance of kosher l'pesach items packaged items that you can't even imagine that there is so much less elsewhere. last year my mom could barely find kosher l'pesach cake mixes . here in brooklyn glatt mart , mountain fruit and pomegranate are bursting with them. dont get me started with hand shmurah matzah! growing up we used to have to order hand shmurah matzah from another city. by the time it got to us many of the matzas were broken. before 9/11 i used to buy hand shmurah matzah in brooklyn and shlep it on the plane when i would visit my parents for pesach. 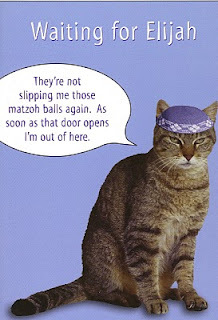 very few matzas were broken. 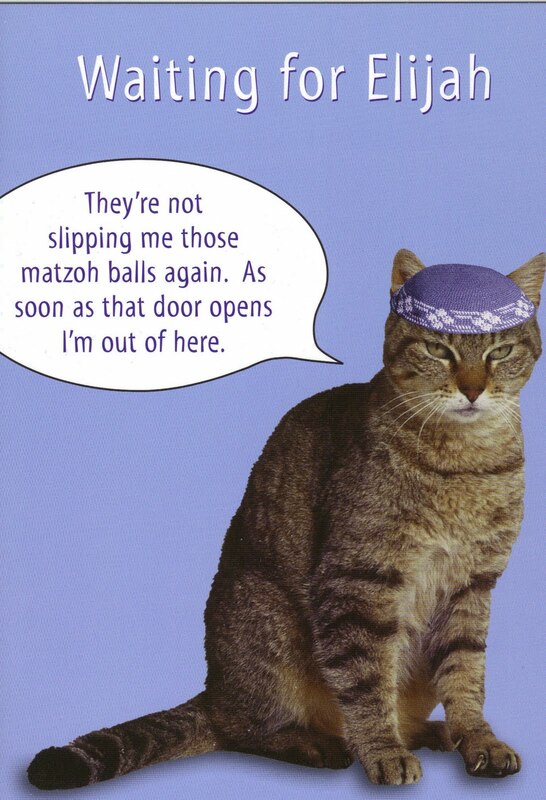 i wasnt the only one shlepping matzah either! after 9/11 they reduced the amount of carry on bags you could take on a plane ride, so i stopped exporting new york hand shmurah matzahs to the midwest. i plan on roughing it in the midwest this pesach, but for those of you who are spending the holiday in the new york area, please make an effort to appreciate all of the kosher l'pesach amenities you are so fortunate to have. i went to a singles event last night and all i kept thinking was "haven't i been here before?" not only had i been at many singles events in that location, many of the same singles have been at those same events i was recollecting. kind of like the twilight zone. this is not the alternate universe i wish to exist in, but exist there i do. i ran in to many i hadn't seen in awhile . i had hoped they had perhaps gotten married. then again perhaps they had . and then got divorced. one never knows. its like even if you actually escape these events for awhile, lucky you might get to be sucked back into this awful scene due to divorce. i hope i will be lucky enough to find a lasting relationship soon so i don't get to forever keep reliving the same singles event replete with all of the same singles. a few weeks ago in the jewish week there was an article that outed mayim bialik of the early 90's blossom fame . it stated that mayim bialik is a shomer shabbos jew. after much googling i also found that she only wears skirts and has made stipulations that she prefers skirts and dresses and does not wear sleeveless in acting roles. very interesting. if i would ever have pegged any actress as being likely to be frum later in life it would have been mayim bialik. but maybe it was her tv character that i thought would one day be frum. blossom was such an independent thinker. i found mayim bialik's facebook fan page so i know that the the frum thing isnt a hoax. many jews feel a connection to celebrities who are even just jewish. i never thought that there would be a day when there would be an orthodox jewish celebrity . i guess mashiach really is on the way. all this talk about sara hurwitz the orthodox woman rabba, rabbi, maharat ... and all i just keep thinking who cares? i guess im just apathetic . im not sure why anyone male or female would want to be a pulpit rabbi to begin with. maybe its just that i would never want to be one. i never gave much thought to the ban on orthodox women rabbis. i guess the maharat or rabbi/rabba thing is more like a degree, much like a masters degree or phd. so to me this isn't the problem. the big problem is sara hurwitz having a larger role in orthodox jewish communal life. in the fifties or in biblical times woman were just in the kitchen so the concept of a woman being a rabbi would be preposterous. in the 2000's women, even orthodox women have prestigious jobs and are leaders in the secular world so they would like to use these talents in the jewish world. beyond apathy the jury of my mind is still in deliberations as to what i really think of the concept of orthodox jewish women as rabbis. women in general are more spiritual than men which is why men have more mitzvot. they need it to keep them in line. maybe this is why only men are supposed to be rabbis. it keeps them busy, make them feel important and keeps them frum. though american jewish women have fought to have a bigger role in jewish communal life i think that the joke is on women. in american jewish folklore one always hears about the jewish mother. she may have the stereotype of being overbearing, but she is the one who seems to hold the family together as well as the one who has kept american jews jewish. does anyone ever hear about the jewish father? i know that i don't. in fact all i hear about jewish men is how non-jewish women like to hold out nets for them because they are known not to be wife beaters. i never hear about how they have held together the jewish family. then again maybe this is why an orthodox jewish woman would like to be a rabbbi or hold a more communal role. the jewish woman has been holding together jewish life for decades . she now just wants to make a more public role of it. cant say that i would want to have that limelight, but i suppose i understand it. i loved the addams family movies and more recently have seen some of the original addams family tv show on dvd. they are so witty even in this century. the addams family was based on the macabre drawings of charles samuel addams. 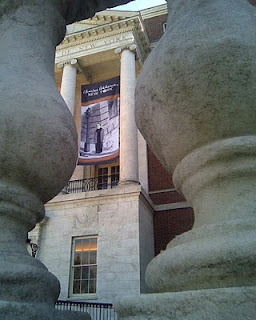 currently there is an exhibit of his work at the museum of the city of new york. its truly amazing. in addition to being the creator of the addams family, he was also a cartoonist for new yorker magazine. this exhibit includes much of his new yorker work , his addams family work as well as his general slice of life in new york city work. he made the mundane a satire. 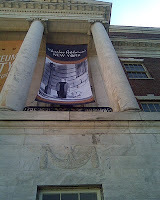 his work is as sharp today as it was in the 1930's when he started working at the new yorker. new york is still the same. people are still the same. if you live in the new york area i highly recommend this exhibit. last night i saw the israeli movie a matter of size . i had ignored it when it was at the israeli film festival this year. a matter of size is a movie about a group of overweight israeli men who leave weight watchers to form a sumo wrestling team. i thought it would just be about a bunch of jewish men kvetching. i see enough of this in real life. as it turns out the israeli weight watchers group was co-ed and one of the main characters in the movie was a woman. a matter of size is an extremely witty movie. it also has a message. some people no matter how much they try to lose weight they may never be svelte. one should find dreams to reach for no matter one's size. if one's love life is less than perfect one should not always blame it on a large physique. everyone has foibles no matter one's size. it was nice to see an israeli movie that is just a slice of life instead of war, politics or the holocaust. i just finished reading a most excellent book called the women who raised me by victoria rowell. victoria rowell is an actress on the soap opera the young and the restless . please don't stop reading folks. this post is not about about a book about the frivolous life of a soap actress. this post is about the fact that its not what your background that defines you, its what you do with your life. victoria rowell is the biological child of a mentally unstable white woman and an unknown black father. she grew up as a foster child and a ward of the state of maine . this woman did not let this stop her from reaching for her dreams . it also did not stop her for being grateful to the people who were present for her in her childhood as well as the rest of her life. whenever i think of foster children i conjure up an unstable child. many children who go through the foster care system get quite messed up. partly due to their upbringing , partly up to their unwise choices. as a young child one of her foster mothers helped her cultivate her innate talent for dance by finding a dance program for foster and disadvantaged children in boston .the rest is history. victoria rowell went on to dance with twyla tharp, become an actress as well as found her own charities for foster children. victoria rowell proves that it pays to be a foster parent or a mentor in general. her biggest achievement is not her career , but the fact that she has such hakaras hatov- such appreciation- for those who helped her along the way to shape who she is today . reading this book can be quite tough. its so sad to see how alone a foster child can be even in the best of cases. what makes it worthwhile is the ending where this child ward of the state has such determination to evolve into such a grounded,positive , accomplished individual. i recently bought a rockin' thermos by a company called nissan. the thermos keeps liquids piping hot for 24 hours! no exaggeration! now i dont have caffeine withdrawal on shabbos morning and all is right with the world. i havent had a roommate for years, but i think that g-d is getting back at me for having all these good roommate-free years by making me live in an apartment building with an elevator. im glad that there is an elevator in my apartment building because i live on a high floor, but i still dont entirely enjoy the elevator experience. sometimes people hold the elevator for me when im getting my mail from the mailbox. on the surface, what could be bad about this? WELL.... let me tell you what. what if i dont feel like being in the elevator with an overly talkative neighbor? id rather wait 10 minutes for the next elevator than deal with that. some neighbors make a habit of a hearty good morning if you see them in the elevator. i don't mind the good morning, but i can barely speak at that hour and some people like to keep saying good morning because they are offended you didn't say good morning back. i say don't bother saying good morning to me in the first place if you don't get the response you need . just be a self-centered new yorker and don't speak to me in the elevator. i would like that better. i talk all day long at work. im really not lonely for conversation at 6:00 a.m.
i live in an old building with those freakishly heavy doors. though holding the door for others would be good strength training, it can be annoying when one is holding lots of packages . the most unfulfilling aspect of holding the elevator for others is when a nosy neighbor is on board. i try to let the door close quickly if i think that type is going to join me in the elevator. i accidentally held the door for someone who i didn't realize was the nosy type. she ruined it for herself. next time she asks me to hold the door for her when she gets her mail im going to accidentally on purpose not hold the door for her. i should really use the stairs more. id get alot more exercise. id also avoid all of the drama. the problem is sometimes im so exhausted that i settle for dealing with elevator etiquette . the greatest thing that happened when my brother got married a few years ago was not that he got married. im happy for him that he is married , but that wasn't the best thing to come from his wedding. the best thing that happened when my brother got married was that i realized how lucky i was to have my family be my family and not my brother's wife and her family . ok i suppose my brothers wife is sort of part of my family now, but she isnt my actual sister. i realized my sister is the best sister in the world and that though my parents arent always perfect i thank hashem every minute that they are my parents and that my brothers wife's parents are not my parents. planning a wedding can bring out the worst in people but in a way it made me appreciate my family more. my family is down to earth and dont care about keeping up with the jones' or the feldmans. my sister cares about actual life issues instead of what is fashionable at saks fifth avenue this season. as far as family goes, the dysfunction you know is always better than the dysfunction you don't know.